I wake up early, before it's very light. I hear rustling. The Thru-hikers around me are packing to move out. I want to get moving too. I choose to stay in my tent and have breakfast, I hear others walking away. “It's okay,” I tell myself. Why do I feel the need to jump on the bandwagon and hurry out with everyone else. Is it the herd instinct? I feel like I'm being left behind. Well I am being left behind, but only temporarily. My rational mind knows that, but emotionally I feel I should get moving faster. I force myself to eat slow. Don't rush. I get going when I get going which is about an hour earlier then I have been. Before the sun too. I head up the trail away from the river. When I say up, it's up! A steep climb for a little bit before it levels off to a consistent ‘PCT’ rate of climb. Up through the forest as I climb so does the sun. Eventually it reaches horizontally through the forest providing dramatic and interesting lighting for my climb. I appear to be climbing a ridge I can see blue sky through the trees to the right and left. Straight ahead it's just dense trees. Up and up and I to the sunshine. Then the trail turns and heads towards Timothy Lake. Timothy Lake is a big lake, a reservoir, a recreation lake. On the way the trail leads me out of the Warm Springs Indian Reservation and into the Mt Hood National Forest. It looks identical. Then the trail drops. Down through different ecosystems to an old growth dense forest of large trees. It stays this way for a long time. Timothy Lake is to the west. A large body of water. I can here the waves lapping the shore through the trees. As I am hiking along the side of the lake, I see Puff Puff heading toward me. I followed her PCT hike last year. She's heading southbound just like Fancy Pants said. I introduce myself and we chat for a few minutes. I look forward to reading her blog about her southbound trip when I finish and get home. Tomorrow I have a reservation at Timberline Lodge. I hope to get as close as I can today. This means I'm trying for thirty miles. I feel really comfortable with twenty five miles. It seems every time I do thirty or more miles I have to pay for it in recovery time. Oh well, so be it. There really isn't any good camping at twenty five miles and I want to maximize my time at the lodge. That means arriving early in the morning. Perhaps in time for their legendary buffet breakfast. So I left early and I'm hiking as fast as I can. 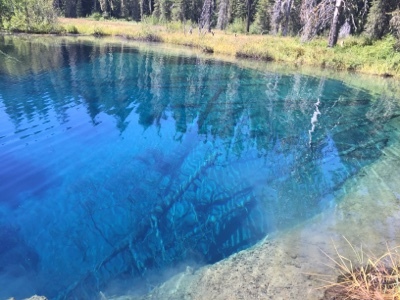 I visit Little Crater Lake when I come to the access trail. It's only a quarter mile off trail. It's a fascinating artesian spring. Blue in color. Really eerie looking into it and seeing whole tree trunks resting on the bottom, perhaps fifty feet down. As I leave Little Crater Lake I feel wiped out, tired, exhausted, ready for a nap. I've only gone fourteen miles and I'm done, stick a fork in me. I sit at the trail junction and eat a peanut butter tortilla and some cheese. I watch as others pass me by, Stitches, Trigger, Yodeler, Still Smiling, Hangman. I get tired of watching them pass one at a time. I finish my lunch, hoist on my pack and step back on to the Canada express. It's so weird how while I'm hiking it's just me and the forest, no one else in sight in front or back. When I stop, that's when I see I'm just another hiker in a long, long, hundreds of miles long line of hikers heading north on the PCT. I power on, convincing myself that I'm only going to the next water source. A spring, cold water. I chug chug up the hill, four miles and there it is. There's everybody else too. Sitting, laying, napping. I collect water enough to dry camp anywhere from here to the Lodge. I don't feel like napping anymore. So after drinking a liter of water I start hiking. I push my lazy body along the trail through force of will. I tell myself that the closer I get to the lodge the less walking I have to do tomorrow. At highway twenty six I have only eight more miles to the camp I was hoping to reach. Eight miles all uphill. I am getting thirsty but hesitant to drink my water because the water report says the creek at the camp is dry. I cross the road and find that an anonymous trail angel has left ice cold cans of red bull and bottles of water. I take one of each and drink them both right on the spot. Exactly the kind of trail magic I need! I down my trail mix and my Gu Energy Gel. I take off up the hill. Even though I've already put in twenty two miles I feel rejuvenated. I power along faster than I've ever hiked. All uphill. Eight miles fly by as I climb at a quick pace. I reach the camp thirty minutes sooner than I expected. I find the trail is lined with blueberries, or are they huckleberries. I don't know the difference they look the same and taste the same to me. Eat handfuls of them as I walk into camp. I find a place for my tent and set it up. Then I sit down and have my dinner. Tomorrow Timberline!